Our little family had one of those amazing Saturdays that you wish you could bottle up and pull out again when they are teenagers and want nothing to do with you. We woke up late and cuddled together in pajamas watching cartoons. We had a late, leisurely breakfast of made-from-scratch buttermilk pancakes prepared with love by my husband – the best pancakes ever! We spent the entire afternoon together outside. We had no where to be; we ignored the dirty house and piles of laundry; I didn’t check my work email once. It all sounds so simple when I think back on it now. But in the moment, it was perfect. We were filled with peace, with love, with the simple happiness of family. I was in near tears thanking God for the blessings of our family. And yet I was sad at the same time because these moments are fleeting. At church the next morning, we sat with a friend, the mom of 2 college-aged kids. She told us that her kids had been visiting the night before, and that they had sat down together and watched a comedy. It was a fun, simple time of laughter and togetherness. She didn’t know that our little family had done something very similar the night before. But her story was just what I needed to hear. I can’t bottle up the wonderful moments with my children while they are young to save for later. I need to appreciate that time moves quickly, but at the same time not let the fact that my children will grow up diminish my enjoyment of the now. 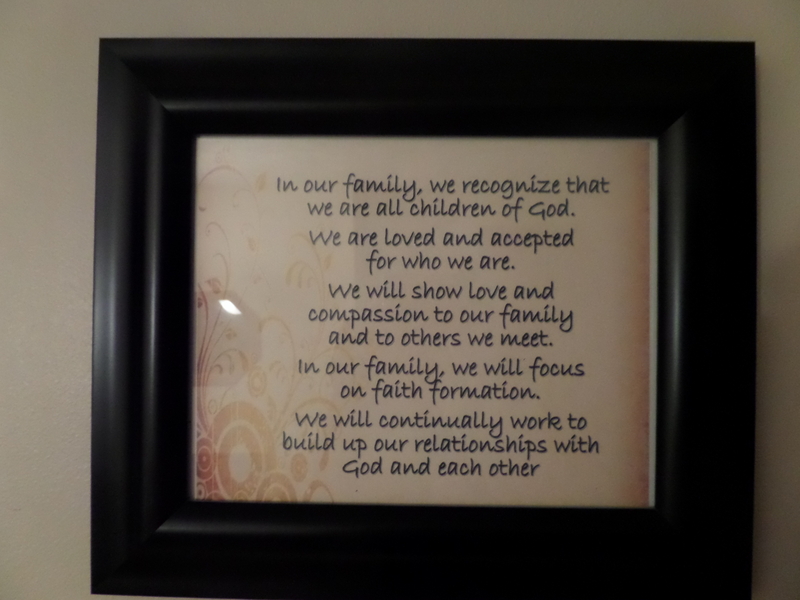 The pledge hanging in our living room stating how we will live as a family. For these traits which declare us individually to be a member in the family of Christ can also be those that say we – the little group of 4 cuddled together watching Frozen – are family. Categories: Parenting | Tags: faith, family, Fruits of the Spirit, God, joy, love, movie night, pajamas, peace, time | Permalink. Thanks for reading! I like writing about these little but awesome moments – it helps me seek out ways to have more of them!! Autumn woke up crying after her nap this afternoon, and her crabby need for cuddles turned into snuggles on our front porch, just her and I, watching the rain, the birdies, and the squirrels. She’s turned into such a busy little girl . . . I’m right there with you in the simultaneously heartbreaking and cup-runneth-over moments.